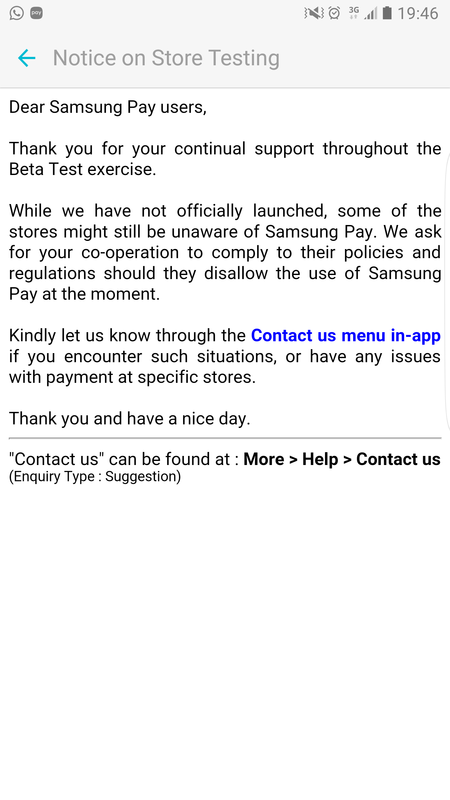 saw this notice in the Samsungpay app just now when paying for my dinner. previously got forumer said popular bookstore reject samsung pay apple pay... this is confirmed. they only allow physical card because when u tap phone, their terminal cannot detect the cc type to print out rebates and redeem info in the receipt. so they claim that their terminals are not ready for phone payment until they can print out the rebates info. even if u pay with physical card, some cashiers may ask u to take out the card to see, they don't like u to tap wallet. i see, i'm not sure what rebates are they talking about, but lets just comply to their store policies then. but then again, if i see the nfc reader i won't even say samsung pay. just contactless payment or pay wave pay pass lor..
some credit cards have 1-5% rebates at some shops. the cashiers are trained already. u say paywave/paypass, then they will ask u whether u r paying with phone or card. if phone, they tell u not ready. pay by card, they want to see your card. Last edited by AnDyLe0; 07-06-2016 at 09:20 PM..
i always thought its linked to the bank more of that physical card. anyway, at toast box i still get my $1 off any set meal purchased with visa pay wave what. whats so demanding at popular? Tried samsung pay for the first time at streats hk cafe, first few attempts failed but idk what the cashier pressed then finally went through. The receipt indicated 'contactless sale' and 'paywave' though. Paid using my dbs debit, the terminal was ocbc, not sure if it matters. Last edited by berber; 07-06-2016 at 11:10 PM..
the wait will be over soon for those who didn't get selected for samsung pay beta program since June is the last month in Q2. Pay petrol at Esso at yio Chu kang....failed! It doesn't really matter which bank card you have. PayWave (Visa) and PayPass (Mastercard) are considered contactless sale. There are 2 types of POS terminals that can do transactions. The bigger machine with numbers uses MST, the contactless reader uses NFC. Sorry for my ignorance, but there are two kinds of big machines with numbers... one is the slot in your card from the bottom kind and the other is the swipe kind, I think only the swipe one accepts mst? all singapore approved models will come with 2 transaction method, one is EMV chip type and one is magnetic swipe type..
u gotta know which one to scan at though. Saw a thread going on about which merchants that applepay can be used, which is nice as it means those can be used for Samsungpay too. Which shops don't have the contactless reader but Samsungpay works after beta testing? Used Ocbc titanium on Samsungpay.